There’s something tropical about sumac trees. The leaves are long, jagged fronds like you’d find on a palm tree–they just don’t seem to fit in a suburban backyard. They belong in the rainforest or on a South Sea island. So flamboyant a tree should have parrots and toucans perching in it instead of robins and chickadees. 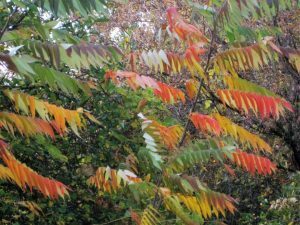 Especially in fall, when sumac goes crazy in an extravaganza of color. It’s one of the very first trees to turn color, and it means business: no pale yellows or brownish-greens. Sumac goes gold, orange, and fire-engine red. There’s a reason for those bright colors, so showy against the still-green other trees. 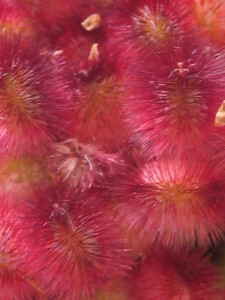 Color is sumac’s way of calling to the birds that eat its berries and spread the seeds: Over here! Berries ripe now. Birds flock to the red, fuzzy berries. Not only in fall—sometimes they leave clusters of the fuzz-covered berries alone till winter, when presumably even fuzzy food tastes better than nothing at all. So sumacs are an important winter food for birds. And yes, there is a small tree called poison sumac. It’s not a very common plant, nowhere near as ubiquitous as its toxic cousin, poison ivy. 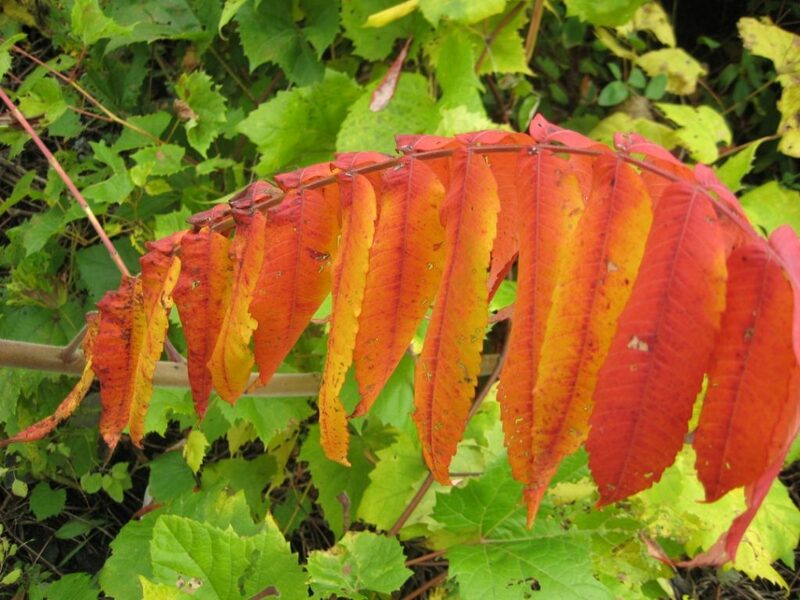 Poison sumac likes wet, boggy areas and riverbanks—it’s not the kind of thing that springs up in most backyards. And it has distinctively white berries: Berries white, take fright. The colorful little tree I’m talking about, staghorn sumac, has red fruit. Berries red, no need to dread! Why is it called staghorn sumac? Male deer (stags) have a fuzzy covering on their antlers in the fall. The deer scrape away at this fuzz, called velvet, rubbing their antlers on branches and tree trunks, so that by winter the antlers are just plain bone. But in autumn, a stag’s velvet-covered antlers feel exactly like the twigs and fruit of this weird little tree, which are also covered with a delicate velvet. So there’s no need to dread sumac. This small, native American species is at its most gorgeous now, in fall, striping yards, roadways and parking lots with its bright, palm-tree-like leaves. Just pretend you’re on a desert island.